One morning, Jessa-Lynn Morton walks into the family taxidermy shop to find that her father has committed suicide, right there on one of the metal tables. Shocked and grieving, Jessa steps up to manage the failing business, while the rest of the Morton family crumbles. Her mother starts sneaking into the shop to make aggressively lewd art with the taxidermied animals. Her brother Milo withdraws, struggling to function. And Brynn, Milo’s wife―and the only person Jessa’s ever been in love with―walks out without a word. 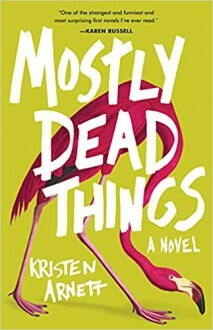 As Jessa seeks out less-than-legal ways of generating income, her mother’s art escalates―picture a figure of her dead husband and a stuffed buffalo in an uncomfortably sexual pose―and the Mortons reach a tipping point. For the first time, Jessa has no choice but to learn who these people truly are, and ultimately how she fits alongside them. Kristen Arnett’s debut novel is a darkly funny, heart-wrenching, and eccentric look at loss and love.